Plating Color: Silver, Gold, Rose Gold Occasion: Daily Life, Engagement, Wedding, Gifts, Party, Etc. 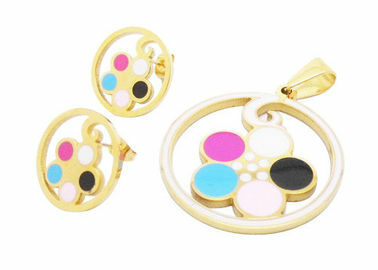 This Jewelry set contains cut-out enameled sunflower in circle pendant and a pair of post stud back earrings. Plating color: Rhodium, silver, gold, rose gold, etc. Style: sunflower shape in the middle.